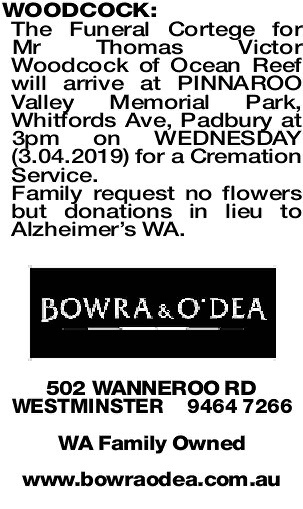 The Funeral Cortege for Mr Thomas Victor Woodcock of Ocean Reef will arrive at PINNAROO Valley Memorial Park, Whitfords Ave, Padbury at 3pm on WEDNESDAY (3.04.2019) for a Cremation Service. Family request no flowers but donations in lieu to Alzheimer's WA. THOMAS VICTOR 28.1.1929 - 22.3.2019 Passed away peacefully. Husband of Joan. Loved by Jaquie, Joanne, Michael and Maryon. The end of a long journey, and the beginning of something new. Now with Joan and Jacqui quietly enjoying a glass or two of whisky, watching the sunset.